For someone who wasn't necessarily what society would consider "girly" growing up (shout out to gender stereotypes! ), I've always loved makeup. Being a cheerleader, I would always do my teammates makeup while riding on a bouncy bus to away games. 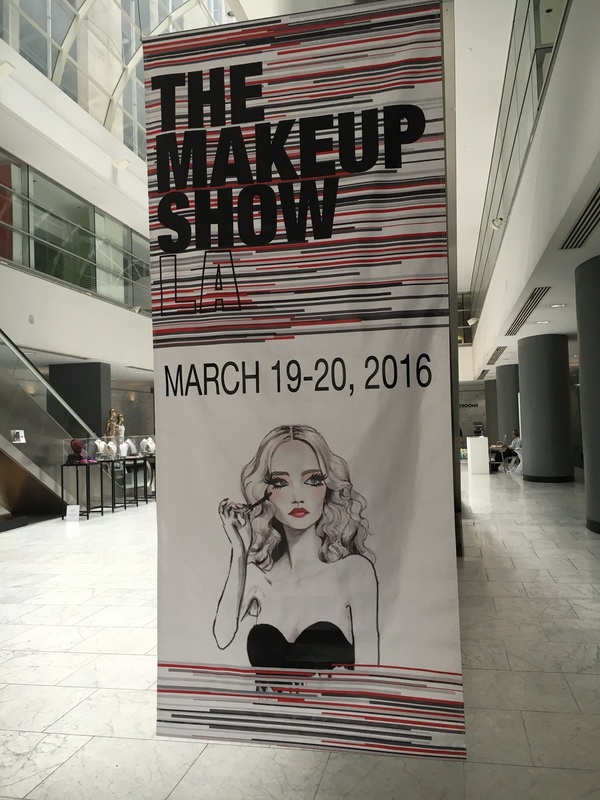 When I heard about The Makeup Show LA, I knew I had to go because it sounded like my kind of party! Going into this, I had no idea what I was in for. Sure, i've been to shows/expos like this before but I felt like a poser as I am not a traditional beauty blogger or a makeup artist. I am just a girl with a blog who loves to look like a full glitz diva when the time comes. After doing a quick lap around the show floor, my first stop was NYX. I am a huge fan of NYX's Soft Matte Lip Cream's because they are not only affordable ($6), but they come in great shades, a long lasting, and they dry to a matte which is a must for me. Having only ever tried their lip products, I checked out NYX's Stay Matte But Not Flat Liquid Foundation and loved it. Again, matte is key for me! 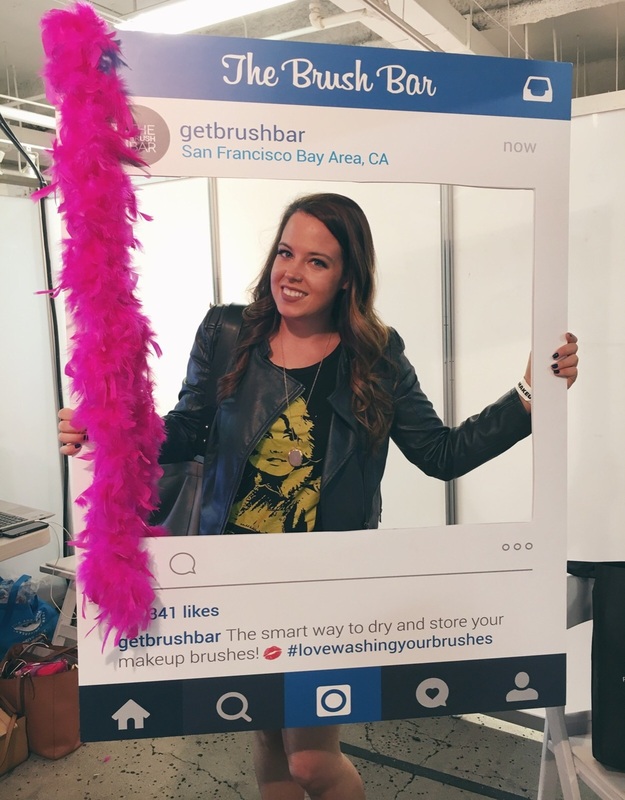 As a Temptu Airbrush system owner, I was stoked to see the company at the show. I got my Temptu a few years back at an event for free. Many times when this happens, you don't get the colors that actually match your skin tone. After speaking with a Temptu team member, we found the perfect shade for me. Whole their products don't give me the matte look that I desire, their formula offers great coverage, plus it's just really fun to use! Always envious of girls who can wear fake lashes / actually know how to apply them, I stopped into the Velour Lashes booth for a little tutorial. First, we picked out the perfect style for me (You Complete Me). Then, one of their artists trimmed the lashes down to fit my eye. After this, she walked me through the application process. I was shocked at how much of a difference the false lashes made on my eyes. I already have pretty long lashes but with the new addition, my eyes really popped! I use MAKE UP FOR EVER Pro Finish Multi-Use Powder Foundation every day and refuse to use anything else. I am such a massive fan of theirs so I was stoked to see the fun things they were doing at the show. More on that later! Urban Decay recently released Naked Skin One & Done Hydrating Skin Perfector and after trying it, I hate to grab some. I usually don't wear BB creams or foundations but this was just too perfect not to buy. It's light and has amazing coverage. I've used it every day since purchasing. When I don't feel like wearing a ton of makeup, I just mix a drop with my moisturizer and go about my day. One of my favorite new discoveries was The Brush Bar. 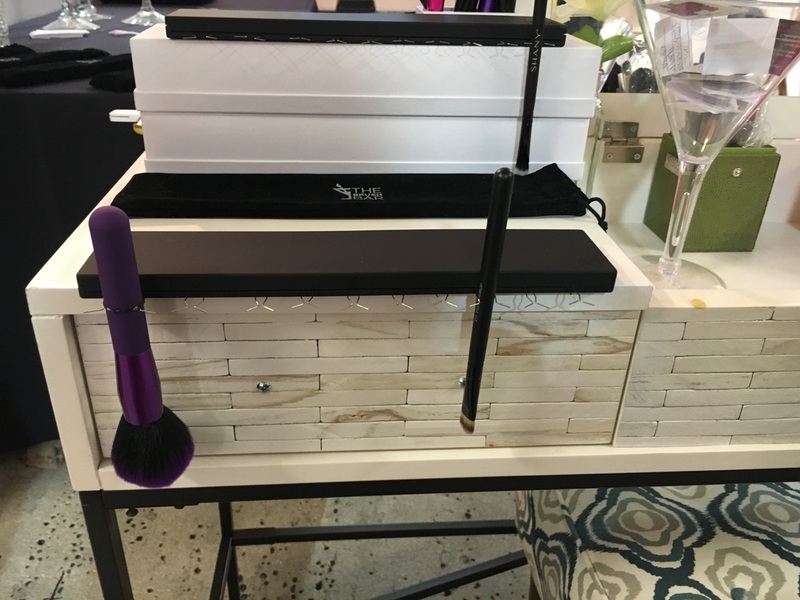 It's the perfect solution to drying your brushes after cleaning. Drying upside down helps the brushes keep their shape better than just laying them flat. I can't be sure but I'd say they also dry quicker this way. If you don't have a ton of bathroom space like, have no fear. It takes up zero room. When you are done, you can just close the case and store it. I am horrible at doing my hair so I stopped into the T3 booth for a chat. They were so great and showed me how to use their magical curling irons. It took all of 5 minutes to completely curl my hair thanks to T3 Tourmaline® and ceramic barrels seal that the cuticle to produce shiny, frizz-free results. I HIGHLY recommend checking out their products! Before leaving, I went to check back the progress of the model. Seriously so insane what you can do with makeup. These people truly are ARTISTS! Here I am in all my full glitz glory! Curled hair and new lashes! If only I could make myself look this good every day. The second I got home, I busted out my Temptu to try my new pod. While it's not practical for me to use every day, I do love using it for special occasions. Temptu's are seriously so much fun. While I didn't get the biggest haul ever, I did purchase a few key things that I really needed. 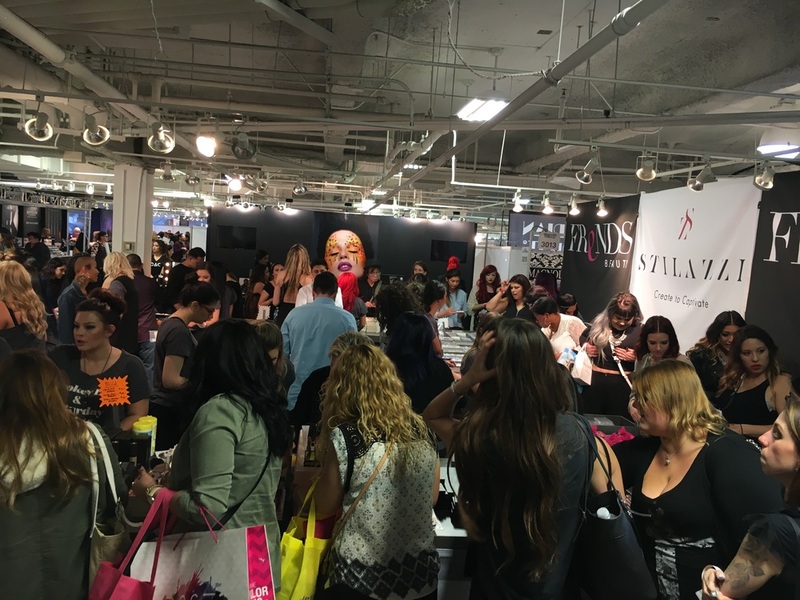 I think prior to The Makeup Show next year, I might have to do a little more research to see exactly what brands will be in attendance as well as clean out my makeup prior so I can come home with twice as many goodies!